The Spray Brush tool allows you to spray graffiti style airbrush effects on the stage. You can also use the spray brush tool to spray instances of symbols on the stage. This can be useful if you want to spray many symbols randomly on the stage. 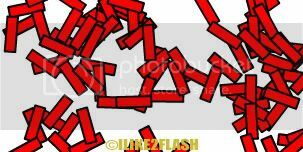 Below I will discuss how to spray symbols in Flash CS4. Checkout the Spray Brush tool article, if you don’t know how to use the spray tool. Create your symbol by selecting Insert > New Symbol. Give your symbol an appropriate name, check movie clip and click ok. Then create your symbol and return to the main stage. I have created a simple rectangle shape, but you can create whatever shape you wish. Alternatively, you can import a graphic by selecting File > Import > Import to Library and convert it into a symbol. 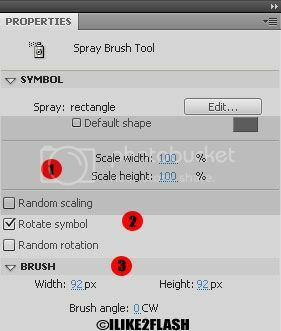 Select the Spray Brush tool. A swap symbol dialog box should appear. 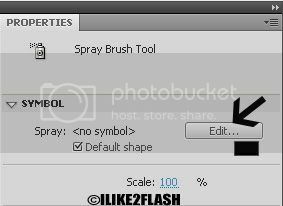 Select the symbol you want from the list and click ok.
Before you start spraying, I will discuss the properties of the spray symbol shown below. 1. This changes the width and height of the symbol by adjusting the sliders. It is recommended that you change both parameters with the same value. 2. You can give your symbol some diversity by checking the following options: random scaling, rotate symbol and random rotation. 3. You can change the width, height and brush angle of the spray symbol. The default width and height is 92 pixels. Have some fun spraying your symbol. Why, not try spraying graphics? I have sprayed a graphic of a pint of beer. 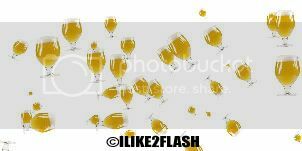 I am very new to flash and am delited to find your tutorials...but I am already having trouble with the sprayer. Every time I try to spray, a warning comes up saying you cannot place a symbol inside itself...I also cannot use the "F" keyboard shortcuts...I have a macbook pro....would that matter??? Are you trying to spray a custom symbol?